In 1900, there were four billion American chestnut trees; they numbered one-quarter of all northeastern hardwoods and were among the tallest and most majestic residents of the eastern forests. Soaring fifty feet before their first branches, they were prized by furniture makers for their hard, straight, rot-resistant wood. In 1904, a ship arrived carrying fungal-infested Japanese chestnut nursery stock, an infestation that accidentally spread to and decimated its iconic American cousin. By 1950, the American chestnuts were virtually all dead, the victims of a fungal blight. The fungus Cryphonectria parasitica enters the tree through wounds or age-related breaks in the bark. It grows and encircles under the bark, forming a canker, and produces oxalic acid that rapidly kills the tree. In 2013, two different approaches were being tested for their ability to resist the chestnut blight: creating a hybrid chestnut tree and, more recently, a genetically modified tree. 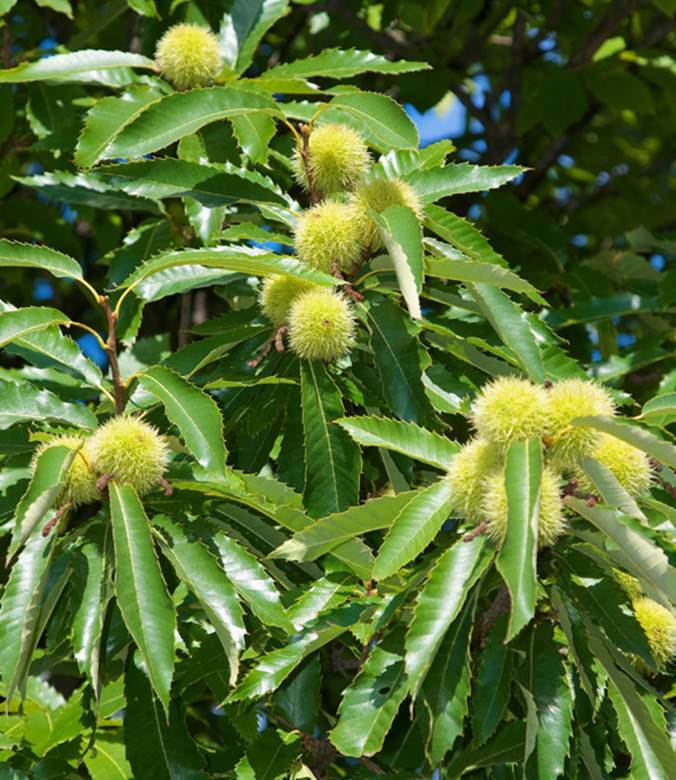 Since 1940, the American Chestnut Foundation has been attempting to successfully blend the fungal-resistant Chinese chestnut with the American chestnut. When attacked by the fungus, the Chinese variety is genetically equipped to build a wall around the fungus before it can secrete a sufficient quantity of acid to encircle the tree; the American chestnut responds in a similar manner but reacts far too slowly to save itself. The foundation’s object is to produce a hybrid that possesses all the attributes of the American chestnut—its hardness, ability to withstand cold and drought and thrive in its normal range from Maine to Louisiana—with the unique characteristic of fungal resistance. William A. Powell, forest biotechnologist, and Charles A. Maynard, a geneticist—researchers from the State University of New York College of Environmental Science and Forestry in Syracuse—are seeking a genetic solution. They are testing a genetically modified chestnut, containing a gene obtained from wheat that manufactures an enzyme capable of inactivating oxalic acid, which stops the fungus before it can kill the tree. As with other genetically modified plants, these trees must be grown in a segregated experimental field where there is no potential for their pollen to fertilize other trees. The success of these approaches will take years to evaluate. SEE ALSO: Fungi (c. 1.4 Billion BCE), Land Plants (c. 450 Million BCE), Gymnosperms (c. 300 Million BCE), Artificial Selection (Selective Breeding) (1760), Biotechnology (1919), Genetically Modified Crops (1982). One century ago, the American chestnut was among the most common and prized hardwood trees in the northeastern United States. Fifty years later, after a devastating fungal blight, few were to be found alive—a loss that persists today.